Plunder the Hidden Vault of a Chaos Warlord! In this adventure, a once-prosperous colony lies silent. The only survivor holds the key to a legendary treasure upon a world of the damned. Explore the lost colony of Chorda's Folly and delve deeper into the central mystery of the Warpstorm trilogy. Sneak, fight, or talk your way into the Citadel of Skulls and retrieve an ancient prize from the clutches of Chaos reavers! The choices you make ensure success, or guarantee defeat. Choose wisely, and reap the rewards of your victory. The second installment of the epic Warpstorm adventure trilogy! Suitable for players of all levels. 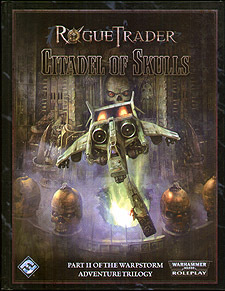 A copy of the Rogue Trader Core Rulebook is needed to use this supplement.